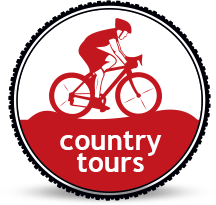 Praha Bike organizes both guided and self-guided bicycle tours. For a more complete experience join our one day guided trip to Karlstejn Castle, Konopiste Castle, Troja Chateau or on multiday trips to Vienna, Dresden or Cesky Krumlov! For self-guided tours we will supply you with a quality bike, helmet, lock, maps, equipment, suggestions and recommendations, bike delivery and pick up service from or to your start or finish destination.. so get ready and go alone or with your friends for the real outdoor adventure! Take a day trip outside of Prague through the beautiful Czech countryside to Karlstejn Castle! Our Karlstejn Castle Bike Tour rolls you southwest of Prague on the bike path along the Vltava and Berounka Rivers. We bike through the Czech countryside to the gothic fortress built by King Charles IV to house the imperial jewels and his collection of holy relics. Our cycling time to the castle takes about 3.5 hours. During our trip we will pass through several villages, making observation, refreshments stops and lunch break. Bike tour along Greenways trails from/to Konopiste Castle through the spectacular Prague countryside along the famous Greenways bike trail. This tour takes you along the famous Greenways bike trail to the historical sight of Konopiste castle. We will bike through the beautiful Czech countryside with stops at Velke Popovice where you can try the local beer from one of the original breweries and thave a Czech lunch at a local restaurant. Konopiště Castle, originally founded as a Gothic fortress that was inspired by French fortresses with a symmetrical layout of the towers, several entrances and drawbridges. Gradually it has been converted into a romantic chateau. Your guide will show you around the courtyard and castle exterior and tell you all about the history of the castle as well as the important and famous owner of Konopiste Castle who was the archduke Frantisek (Franz) Ferdinand d'Este. A successor to the Austro-Hungarian throne whose assassination in Sarajevo in 1914 became a pretext of World War I. Our trip ends at Praha Bike shop approximately at 6 PM. One day bike trip to unique Pruhonice castle & Pruhonice UNESCO park and botanical garden. The contemporary shape of the Chateau at Průhonice is a result of numerous reconstructions of the small medieval Gothic castle. It is built on a rocky promontory above the stream Botič, close to the Romanesque manor in which only the Romanesque Chapel of the Nativity of the Virgin Mary is still-standing. The first written report on Průhonice owners dates back to the 1270s. The natural park (the area of 250 hectares) was founded in the year 1885 by the Count Arnošt Emanuel Silva-Tarouca. We can see and enjoy now the result of his long and hard work which considered as original masterpiece of garden landscape architecture of worldwide importance. It has artistic and historic significance and also valuable from the dendrological point of view with the collection of about 1600 species of local and exotic plants. The Relaxing bike ride along the Vltava river to Troja Chateau & off Prague's tourist path! The trip to Troja Chateau is a nice and easy bike tour along the Vltava River. We fallow a new bike path from the center of Prague to the first Baroque Summer Palace in Prague. Beautiful Troja Chateau, built in the 17th century for the Counts of Sternberg, is located near the Prague Zoo and Botanical Gardens. We will visit the biggest of Prague's parks, Stromovka and Letna, where will stop for a cold Czech beer!